How many sides does a gazebo have? This is an interesting question. How many sides does a gazebo have? Is it 6? Is it 8? The answer is that it can have any number of sides. It depends on how it’s designed. When I first met Dan Schellenberg when I purchased Archadeck of Austin, I was impressed at what a genuinely nice guy he is. I also noted that he was very analytical and very detail oriented. He’s the type of guy to sit back and let others go first. So I asked him if he came from a large family and indeed he came from a family of 7. As we sat over pizza, he mentioned that his father could cut any pizza into 7 equal slices after raising a family with 5 kids that all loved pizza. When Dan showed me this gazebo project he just finished, I studied the number of sides and became very perplexed. I stood under the gazebo and looked up at the ceiling and counted the number of panels or sides. Indeed – 7! Did Dan’s father build this gazebo? How in the world did Dan come up with a 7-sided gazebo design? It’s simple. He paid extremely close attention to his customers envisioning how they would want to live in their new custom outdoor space. The homeowners were a lovely couple. They were a little older and had grown children and a sprinking of grandchildren. 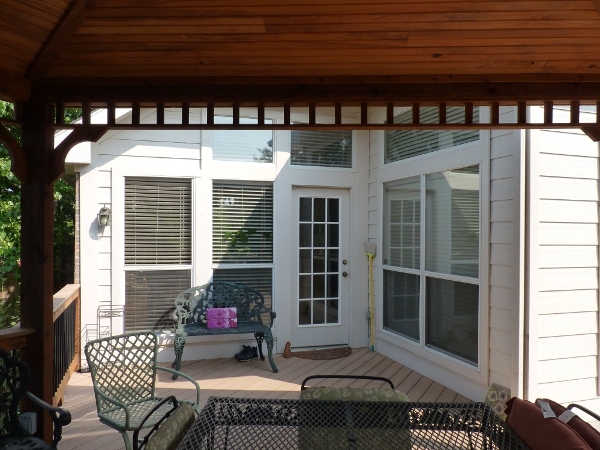 Their door leading to the backyard had a small deck/patio. The new extended gazebo-covered deck would adjoin directly to that area. Although that old area was too small to be a useful space, it presented a real problem for building the gazebo. Dan knew the homeowners would not want a gazebo post right in the middle of their walkway from the backdoor to their gazebo. So, he added a side to the gazebo and made it a long side. 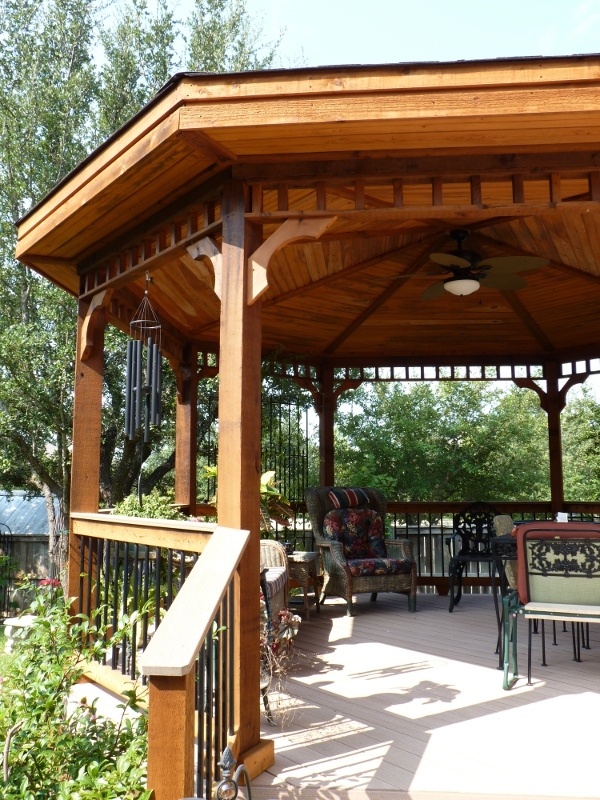 Looking at the gazebo from the yard, you might never noticed the 7-sided design of the structure. But creating this long side allowed the family to walk freely from their home to the gazebo without having to see or walk around a post every time. Here’s Dan talking about this project. This entry was posted on November 15, 2010 by austinporchandpatio. It was filed under Gazebo and was tagged with Austin decks, Austin Gazebo, decks Austin, gazebo, Gazebo Austin.